Saint Catherine (also spelled: St. Katrine; Egyptian Arabic: سانت كاترين‎ pronounced [ˈsænte kætˈɾiːn]) is a city in the South Sinai Governorate. It is located at the outskirts of the El Tur Mountains at an elevation of 1,586 m (5,203 ft), 120 km (75 mi) away from Nuweiba, at the foot of Mount Sinai and Saint Catherine's Monastery. As of 1994[update], its population was 4,603. Although Saint Catherine was not established as a city at that time, it was always part of the Egyptian Empire throughout history and it was part of the province of "Deshret Reithu". In the 16th century BC, the Egyptian pharaohs built the way of Shur across Sinai to Beersheba and on to Jerusalem. The region provided the Egyptian Empire with turquoise, gold and copper, and well preserved ruins of mines and temples are found not far from Saint Catherine at Serabit el-Khadim and Wadi Mukattab, the Valley of Inscription. They include temples from the 12th Dynasty, dedicated to Hathor, goddess of love, music and beauty, and from the New Kingdom dedicated to Sopdu, the god of the Eastern Desert. Located at the foot of Mount Sinai, Saint Catherine's Monastery was the start of the city, it was constructed by order of the Emperor Justinian between 527 and 565. Saint Catherine City is one of the newest townships in Egypt. There are several schools including a high school, a hospital, police and fire brigade, a range of hotels, post office, telephone centre, bank and other important establishments. The township's oldest settlement is Wadi El Sybaiya, east of the city's monastery, where the Roman soldiers, whose descendants the Jebeliya are, were accommodated. It started growing into a town after the tarmac road was completed in the 1980s and the tourist trade began. Many of the nomad Bedouins moved to small settlements around the city's monastery, which collectively make up St Katherine's Town. The districts of El Milga, Shamiya, Raha and Nabi Harun form the core of the town — Saint Katherine's downtown, at the end of the tarmac road where the valleys of Wadi El Arbain (Wadi El Lega), Wadi Quez, Wadi Raha, Wadi Shrayj and Wadi El Dier connect to the main valley, Wadi Sheikh. There are settlements in Wadi Sheikh before town and other smaller ones in the valleys. Saint Catherine is the capital of the Municipality of Saint Katherine, which includes these outlying areas as well. The town's monastery lies in Wadi el Deir, opposite Wadi Raha (Wadi Muka’das, the Holy Valley). Mount Sinai can be reached from the monastery or, alternatively, from Wadi El Arbain where the Rock of Moses (Hagar Musa) and the Monastery of the Forty Martyrs are. Köppen-Geiger climate classification system classifies its climate as desert (BWk). It has the coldest nights of any city in Egypt. Its humidity is very low. The highest mountains ranges in Egypt surround the town with many smaller valleys leading from the basin to the mountains in all directions. The township is at an elevation of 1,600 metres (5,200 ft). The high altitude of the town itself and the high ranges of mountains which embrace it provide a pleasant climate, with refreshing mild summer nights and excellent spring, while winter days are relatively cool for the region and the nights can get very cold on rare occasions, making it sometimes necessary to heat buildings and public places. Different sources give different average temperatures for Saint Catherine's town. Saint Catherine is considered to be one of the coldest towns in Egypt with Nekhel and many other places especially in mountainous Sinai. Infrequent snowfalls in Saint Catherine take place during the winter months of December, January and February, however snow has also occurred in late autumn and early spring. Saint Catherine Town lies at the foot of the Sinai high mountain region, the "Roof of Egypt", where Egypt's highest mountains are found. Some trekking groups however prefer especially the winter season as they find it more interesting and lovely to hike and climb in these conditions. The town also puts a great pressure on the water resources, as ground water in the valley is from the mountains. Today water has to be purchased and brought in by trucks. As of September 28, 2011, water from the Nile is being transported to Saint Catherine via a pipe line, built with the help of the European Union. Saint Catherine is in a region holy to the world's three major Abrahamic religions, Christianity, Islam and Judaism. It is a place where Moses is believed to have received the Ten Commandments; a place where early Christianity has flourished and the Orthodox monastic tradition still continues in present day; a place which the prophet Mohammed took under his protection in his Letter to the Monks and where people still live in respect to others. Many events recorded in the Bible took place in the area, and there are hundreds of places of religious importance in the city. There are two ancient churches, and the Monastery of St Katherine and the Rock of Moses. The traditional people of the area, the Jebeliya Bedouin, are a unique people having been brought from south-eastern Europe in the 6th century AD. Originally Christians, they soon converted to Islam and intermarried with other nomad tribes. Some segments of the tribe arrived relatively recently from the Arabian Peninsula. Their culture is very similar to other Bedouin groups, but they preserved some unique features. Contrary to other Bedouin tribes, the Jebeliya have always been practicing agriculture and are expert gardeners which is evident in the wadis around Saint Catherine. They have lived and still live in a symbiotic relationship with the monastery and its monks, and even today many Bedouin work with the monastery on its compound or in one of its gardens. The city also hosts a number of Greeks and Russians, who control the historic monastery. The cold weather of the city, specifically in winter nights, made people used to stay at heated homes early, and keen on growing plants which could produce liquids to warm themselves. The Jebeliya are skilled gardeners and craftsmen who have been building gardens, houses, store rooms, water dams and other structures in the mountains for centuries. The techniques used are very similar to Byzantine methods, partly because of the natural environment, and partly because of the interaction between the Bedouin and the monastery. In fact, they have received seeds from the monks to start crops. They grow vegetables and fruit in stone-walled gardens called bustan or karm, and mastered grafting where a branch of a higher-yielding lowland variety is planted on a more resistant but low-yielding mountain variety. A variety of species of plants and crops grow here, such as almond, because of the moderate climate. Other fruits include apple, pear, apricot, peach, fig, pistachio, dates and grapes. Walnut is rare but grown at a few locations. Mulberry grows wild in some of the wadis and they belong to the whole tribe. Wild figs, tasty but small, grow in many places. Olives are essential to the natives, and found in many locations. Vegetables are not grown to the extent as in the past because of less water. Flowers and medicinal herbs are grown everywhere. The gardens are usually built in the wadi floors in the main water course, and are encircled by massive stone walls. These walls have to withstand regular flash floods, retain the soil — thus called "retaining walls" — and protect the garden from wild animals. A number of gardens have water wells, but these wells freeze in winter and sometimes in spring and autumn. Today usually generators pump the water, but many shadoofs can still be seen. Water is often found at higher elevations, either in natural springs or in wells made at dykes called jidda. The Bedouin built small dams and closed off canyons to make reservoirs. In either case water is channelled to small rock pools called birka, from where it was available for irrigation. Water was flown in narrow conduits made of flat rocks sometimes for miles — they are still visible but today gardens rely on plastic pipes (khartoom). These gardens are a unique feature of the high mountain area, along with other stone and rock structures. Bedouin houses are simple and small stone structures with cane roofing, either incorporated in the garden wall, or standing alone a bit further up from the wadi floor, away from the devastating flash floods that sweep through after occasional heavy rains. Houses are often built next to huge boulders; natural cracks and holes in it are used as shelves and candle holders. Smaller rock shelters and store rooms are constructed under boulders and in walled-up caves, and are found everywhere in the mountainous area. Some of them are easily visible landmarks, such as in Abu Seila or Farsh Rummana, but most are hard to distinguish from the landscape. Ancient leopard traps can be seen in many places, either under boulders such as in Wadi Talaa, or standing alone as on the top of Abu Geefa. The traps functioned by placing a goat inside as bait, and the entrance was slammed shut with a big rock when a leopard entered. There are no more leopards left in Sinai; the last was spotted in the 1980s. In many places big boulders can be seen with oval-shaped marks engraved on the surface. They are marriage proposal rocks, where a lover drew a line around his foot on the rock face next to his lover's foot print. If the two marks are encircled, their wish was granted and they got married. Wishing rocks are boulders, usually a short distance from the main paths, with a flat top — according to local legend, if one throws a pebble and it stays on the top, one's wish will come true. According to the governmental plans, the population of the city is expected to increase from 4,603 to 17,378 in 2017. The increasing numbers of Egyptians living there, and visiting the city will succeed in accomplishing that developmental national plan. 3,031 (75.1%) of Saint Catherine's population is formed of Jebeliya Bedouins, while the rest are Egyptians, Greeks, Russians and western Europeans. Assuming a natural growth rate of 3% to the year 2017, the Bedouin population would become a minority in Saint Catherine, dropping to 36% of the total population if Ministry of Planning targets are achieved. The city of Saint Catherine and other close towns fall within the region of Saint Katherine Protectorate, which was established in 1988. It is a unique high altitude ecosystem with many endemic and rare species, including the world's smallest butterfly (the Sinai baton blue butterfly), flocks of shy Nubian ibex, and hundreds of different plants of medicinal value. The region has been declared a UNESCO World Heritage Area. Some of the species are endangered, but there are many species of wild animals, birds and flowers to see. There are many Sinai agamas, rock hyraxes and foxes. Harmless to people, foxes regularly visit the town at night to steal and scavenge. Rock hyraxes are often seen frequenting gardens, and there is a wide range of migrating and resident birds from Europe. Also, there is a large number of feral donkeys in the mountains who migrate to the region and lower lying areas (reportedly as far as El Tur) in the winter and return to graze for the more plentiful summer. Many of them belong to families and are stamped with marks. However, they put big pressure on the ecosystem and there is a move to reduce their numbers by the Saint Katherine City Council. One of the principal goals of the Protectorate is to preserve the biodiversity of the fragile ecosystem, with an emphasis on the Nubian ibex and the wild medicinal and aromatic plants. The St Katherine Protectorate is another major job provider in the area, although the number of local Bedouins employed fell back sharply since the initial European Union support ended, according to local sources. Snow is the best source of water as it melts slowly, thus releasing water at a steady pace, replenishing the underwater catchment areas better. Water from rain flows down fast in the barren mountains, which may cause flash floods and less water would remain. The views from the highest mountains in Egypt are extensive, and there are many other natural sights in the wadi system. There are springs, creeks, water pools, narrow canyons, steep wadis with large boulders, rock formations, and barren plains with islands of vegetation. On the top of the mountains there are many interconnected basins with a unique high altitude ecosystem, home to the world's smallest butterfly and other rare plant species. The highest mountain in Egypt is Mount Katherine, and there are many other peaks in the area over 2,000 m (6,600 ft). Mount Katherine can be reached via Wadi El Arbain or Wadi Shaq, either way a full day. Usually the trek routes make circles, with sleeping at the top. There is a small Orthodox chapel at the top. The Monastery constructed a small stone hut where trekkers and pilgrims can stay for overnight in the harshly cold weather. There is usually a candle and matches for travellers to use, but one can also leave some if they wish to. There is also a broom and rubbish bins, and people are expected to clean up after themselves. From the peak there are views over Mount Sinai (Jebel Musa), and on a clear day one can see as far as Sharm el Sheikh and the Red Sea. Jebel Abbas Basha is another popular peak; from here one can see the villages and the city as well as the rest of the high mountains. It can be reached in one day, but if one wants to stay for the sunset, it is better to make it in two days, either sleeping on the top or in Wadi Zawatin or Wadi Tinya at the base of the mountain. A little further is Jebel el Bab, which could be visited in two days, but better included in a 3-to-4-day trek visiting other places as well. On the way up from Wadi Jebal one would pass Ras Abu Alda, a rock formation resembling the head of a mountain goat, from where there are views to Mount Umm Shomar, another popular peak even further, and the southern ranges. From the peaks of Jebel el Bab and Bab el Donya one can look over Mount Tarbush and can see El Tur and the Gulf of Suez. Under the peaks is the spring of Ain Nagila. Other popular peaks in the area include Jebel Ahmar, Jebel Serbal, Jebel Banat and Jebel Sana. There are many small ponds flowing under the rocks in lush Wadi Talaa Kibira, leading down to the biggest water pool of the area, Galt el Azraq — "the Blue Pool". Its colour is actually changing due to the regular floods and melting snow — one brings sand from higher up, and the next takes it further down and cleans the pool. It is safe to swim in it. There are permanent pools at the top of Wadi Shaq Tinya and the Kharazet el Shaq, in a dramatic setting. The water from Wadi Tinya drops into a granite pool from which it flows down to other pools and falls into a deep wadi, some places running under rocks, and at other places resurfacing. The water is clean enough to drink in the upper pool. At the beginning of Wadi Shaq there is a narrow canyon where there are permanent granite waterpools, from which water disappears in the sandy floor at one place and only re-emerges before the end of the wadi. Water trickles from a rock into a double fountain in Wadi Tubuq. The lower fountain is for animals, locals drink from the upper one. It is considered safe, although the water might need to be treated, for instance by boiling. There is also a 1000-year-old mulberry tree in Wadi Tubuq, which is protected by tribal law. From Wadi Tubuq one can descend to Sid Daud — a narrow, steep path leading through small caves under the boulders. In the narrow canyon of Wadi Sagar there is another water fountain. Because of the steep path, animals cannot reach it and the water is safe to drink. A rarely visited route through Wadi Umm Surdi leads through a narrow canyon to Wadi Mathar and another mulberry tree which grows just outside a communal garden. While the main tourist attractions are Saint Catherine's Monastery and Mount Sinai, there are many other places of interest in the area. One of the prime historical attractions in the area is the palace of Abbas I, the Wali and self-declared Khedive of Egypt and Sudan between 1849 and 1854. The palace was built on a mountain at the time called Jebel Tinya, but later named after him and today called Jebel Abbas Basha. The palace has never been finished as he died before it was completed, but the massive 2-metre-thick (6.6 ft) walls made of granite blocks and granite-sand bricks still stand firmly. The open quarry on the top of Jebel Somra, just opposite Jebel Abbas Basha, is still visible with many huge blocks lying around. Other blocks were cut from Wadi Zawatin, at the beginning of the ascent to the palace. The bricks were made on site while the mortar, made of lime and water, was burnt in kilns in the surrounding valleys. To be able to carry out the work, first a road accessible to camels and donkeys was built in order to transport the supplies. The road, starting at Abu Jeefa and going through Wadi Tubuq and Wadi Zawatin, is still in use today. Son and successor of the great reformist Muhammad Ali Pasha (1805–1848), Abbas Pasha was in many ways the opposite. He had "a lasting distrust of foreigners [and] strongly opposed many of the Western inspired change introduced by his father Mohammed Ali Pasha and he is remembered as a traditionalist and reactionary who undid many of his grandfather's modernising reforms. His secretive and suspicious nature led to much speculation over his death; it is uncertain whether he was murdered or died of a stroke." Abbas Pasha suffered from tuberculosis, so one of the reasons he wanted to build his palace in the high mountains was for medical reasons. On the other hand, he liked a secluded lifestyle and had other remote palaces. According to traditions he selected the place after placing meat on the top of Mount Sinai, Mount Catherine and Mount Tinya, and it was here at the former that the meat decayed later, suggesting a better environment and cleaner air. Another account recalls that this story was actually made up by the monks to keep him away from the holy peaks. In any case, his selection would have been just as good with magnificent views from the palace over the Sinai mountain range. Although Abbas is "best remembered for the emancipation of the fellaheen and the construction of the Cairo-Alexandria railway line in 1851", he "had a significant influence on the immediate area around St Katherine. Besides the construction of the mountain-top palace he commissioned the building of the camel path up to Mount Sinai and the Askar barracks on the way to the monastery, which now lies in ruins." There are hundreds of ruins of Byzantine monasteries, churches and monastic settlements in the area, some of them not much more than a pile of rocks, and others difficult to distinguish from Bedouin buildings, but there are several very well-preserved ones. Many can be found in the wide and open Bustan el Birka area, approachable from the settlements of Abu Seila and Abu Zaituna, including churches, houses on hills overlooking gardens in the wadi floor, buildings in clusters and hermit cells under rocks. They are among the best preserved ones and they can be easily reached from the village. There is a graceful little church in very good shape in Wadi Shrayj, passing other somewhat more ruined Byzantine buildings. Further up from the church there are more ruins, some dating back to the Nabataean era (c. 300 BC – AD 100). In Wadi Mathar (Wadi Shaq) there is a hermit cell under a huge boulder, and the remains of the monks who died in there centuries ago are still in the walled-up chamber. Further up is a well-preserved monastic settlement with houses and a round building which might have been a storage room. Byzantine Nawamis, circular prehistoric stone tombs, are found at many locations, such as at the beginning of Wadi Jebal or in Wadi Mathar. Halfway in Wadi Jebal there is a Roman well, and further on a well-preserved Byzantine church next to a walled garden and spring. There is another church at the spring of Ain Nagila, at the foot of Jebel el Bab. Ruins of other settlements and buildings can be found in Wadi Tinya, Wadi Shaq Tinya, Farsh Abu Mahashur and many other places. The building technique of the Bedouin is taken from the Byzantine settlers, so it is often difficult to tell structures apart. Furthermore, the Bedouin often used the ruins in later times. However, there are telling clues — Byzantine buildings were scattered close to each other in small settlements, and round buildings are most likely to be from the Byzantine period. While the Bedouin have storage rooms constructed under rocks, they would have been too low for hermits to pray in an upright, kneeling position. Rounded walls, niches and shelves and tiny doors are typical of Byzantine stone dwellings. Stones were laid without mortar and roofs were often absent. Traces of ancient water systems or conduits can also be found which were used to direct rainwater to the settlement and for irrigation use. Typical of the Byzantine era, water conduits or channels directed the mountain rains to cisterns or pools. Water conduits were constructed using natural drainage lines in granite and by cementing flat stones with natural mortar. The outdoor courtyards are thought to be an area for meeting guests and for cooking. A bit further afield, at Serabit al-Khadim, there are ancient turquoise mines and pharaonic temples from the 12th Dynasty, dedicated to Hathor, goddess of love, music and beauty, and from the New Kingdom dedicated to Sopdu, god of the Eastern Desert. It can be reached from Wadi Feiran via Wadi Mukattab (the "Valley of Inscriptions"). There is a massive Nawamis close to the Oasis of Ain Hudra, as well as a Pharaonic Rock of Inscription. It lies not far from the main road to Dahab, but one should not attempt to find it oneself. Guides can probably be found in Ain Hodra, or a safari can be organised in St Katherine that includes this attraction. The Blue Desert (Blue Mountain) can be seen just before reaching St Katherine to the left in a wide open wadi. Anwar Sadat, who loved the area and had a house in St Katherine, paid with his life for this move. The display was made by Belgian artist Jean Verame in 1980–81, who painted many of the boulders over an area of around 15 km2 (5.8 sq mi) and a hill blue. From the air it looks like a dove of peace. A popular day trip from the city is usually accompanied by a campfire and music around this area, which adds a bit of blue colour to the red of sunset. Beyond the many religious places found around the Monastery of St Catherine and on the top of Mount Sinai and Jebel Safsafa there are many other churches, monasteries and holy places in the area and a bit further afield. The Chapel of St Catherine is on the summit of Mount Katherine, the mountain where the body of the saint from Alexandria was placed by angels, according to Christian beliefs. The saint, born as Dorothea in 294 AD, was educated in pagan schools but converted to Christianity for which she was executed. Her body vanished, but some three centuries later, monks guided by a dream found it on the mountain. It was brought down and placed in a golden casket in the Monastery, which became known since the 11th century as the Monastery of St Catherine. The Monastery of St Katherine has been a working monastery from its creation in the 4th century to the present day. It holds one of the most religiously and historically significant libraries in all the world, second only to that of the Vatican. Being of religious importance to Jews, Muslims, and Christians the area receives nearly 100,000 visitors annually and more are projected every year. While the struggle to limit access and visiting hours has done little to preserve the monastery, it has also provided a measure of protection during political turbulence. The Hagar Musa (Rock of Moses) in Wadi El Arbain, from which Prophet Moses fetched water, is a holy place to all the big monotheistic religions, Judaism, Christianity and Islam. Locals believe the twelve clefts on it represent the twelve springs mentioned in the Quran (Sura 2:60). It is also mentioned in the Exodus as the rock which sustained the children of Israel (1 Cor. 10:4). There is a small Orthodox chapel next to it. According to Swiss orientalist Johann Ludwig Burkhardt, the Jebeliya Bedouin believe "that by making [female camels] crouch down before the rock [...] the camels will become fertile and yield more milk". There is also a Bedouin marriage proposal rock in the walled compound. The Monastery of the Forty Martyrs in Wadi El Arbain was constructed in the 6th century in honour of the forty Christian martyrs who died in Sebaste (central Turkey). Monks relate that forty Christian soldiers from the Roman Army in the 3rd century were commanded to worship pagan gods. They refused and were put to death by being exposed at night to the bitterly cold winds off a frozen lake. Those who survived until morning were killed by the sword. In the grounds of this monastery is a chapel dedicated to the hermit Saint Onuphrius. Coming from Upper Egypt, he was said to have lived for seventy years in the rock shelter at the northern end of the garden, until he died in AD 390. The Monastery of Cosmas and Damianos in Wadi Talaa is named after the martyred brothers who were doctors and treated locals for free in the 3rd century AD. The garden of the monastery, looked after by a Bedouin family, has a long olive grove, some tall cypress trees, and other fruit trees and vegetables. There are more gardens belonging to the monastery further down in the wadi. The Chapel of Saint John Klimakos (also known as "John of the Ladder"), was built in 1979 in Wadi Itlah to commemorate John Climacus's devotional work in the 6th century AD. Also spelt St John Climacus or Climax, the saint spent forty years in solitude in a cave above the existing chapel. "During this time, Klimakos was elected Abbot of Sinai and asked to write a spiritual guide. He composed The Ladder of Divine Ascent which likens spiritual life to the ladder seen by the Patriarch Jacob extending from earth to heaven (Genesis 28:12-17)." According to the book the ladder "consists of 30 rungs, each step corresponding to a spiritual virtue. Through silence and solitude hermits and monks sought to climb the divine ladder. The first rung instructs the renunciation of all earthly ties and the next 14 relate to human vices such as talkativeness, anger, despondency and dishonesty. The final 15 rungs relate to virtues including meekness, simplicity, prayer, holy stillness and humility. The crowning virtue is love." The Monastery of Wadi Feiran, with its chapel dedicated to Prophet Moses, is some 60 kilometres (37 mi) before reaching St Katherine. The wadi is mentioned in the Genesis (21:21) "as the place where Hagar dwelt with her son after Abraham sent her away", As late as the 7th century, Feiran was a city and an important Christian centre, with its own bishop. The Monastery of El Tur was built by Emperor Justinian in the important port city, which was an early Christian centre from the 3rd century AD. Today it lies in ruins but there is a new monastery in the city, as well as a church and a guest house. The Spring of Moses is reputed to have therapeutic abilities. Other important monasteries in the region are the Monastery of Ramhan south of Mount Catherine, the Monastery of Hodra near the oasis of Ain Hodra, and several smaller, ruined monasteries and churches. Most of the best preserved places are found close to the village of St Katherine in Wadi Shrayj, Wadi Anshel, Bustan el Birka, Wadi Abu Zaituna, and also in the High Mountains such as at Ain Nagila and in Wadi Jebal. Places important to local people include the tombs of local saints such as Sheikh Harun (Aaron's Tomb) and Shaikh[spelling?] Salah (Nebi-Salah's Tomb) in the main wadi (Wadi Sheikh) before reaching town, or Sheikh Awad and Sheikh Ahmed in the mountains. Some of the Bedouin gather at these tombs to celebrate "Zuara", while others consider this practice to be "bidaa", an innovation and not consistent with Islam. (In fact, most of the bidaa is actually predating Islam and is rather a survival of a tradition than an innovation.) Zuara, also known as Sheik[spelling?] Day or Mulid (Moulid), "is performed by most Sinai tribes at the tombs of Sheiks, or in nearby shelters called mak'ad when a Bedouin or group of Bedouin wish to ask the Sheikh to intervene with Allah on their behalf. Zuara is the generic name for any activity of this sort. In addition to the Mulid, the bedouins often practice Zuara on a weekly basis. The sick Bedouins or their relatives, pregnant mothers looking for healthy children, or people looking for a good crop, go to a tomb. [...] Until the 1956 war in the Sinai, the Gebeliya and the Auled-Said shared a common Mulid (the annual Zuara) at the tomb of Nebi-Saleh; however the war forced them to conduct the ceremonies at separate locations; but the tribes are still apparently close. Now the Gebeliya go to Aaron's tomb down the road, and the Auled-Said go to Nebi Salah's tomb. Both go in the 8th month. The Garasha and Sawalha also go to Nebi-Salah's tomb for their Mulid but in the 7th Month." Some of the Jebeliya gather at the Tomb of Sheikh Awad on the second day of Eid al-Adha, the "Feast of Sacrifice". 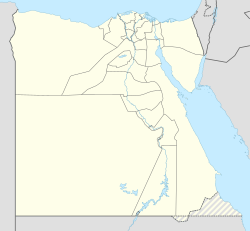 ^ "Egypt Climate Index". Climate Charts. Retrieved 7 August 2013. ^ a b "St Catherine Climate and Weather Averages, Egypt". Weather to Travel. Retrieved 6 August 2013. ^ "St. Katrine, Egypt: Climate, Global Warming, and Daylight Charts and Data". Climate Charts. Retrieved 5 August 2013. ^ "Climatological normals of St. Katrine". Hong Kong Observatory. Retrieved 5 August 2013. ^ "Climate: Saint Catherine". Climate-Data.org. Retrieved January 24, 2019. Shackley, Myra (1 January 1998). "A golden calf in sacred space? : The future of St Katherine's monastery, Mount Sinai (Egypt)". International Journal of Heritage Studies. 4 (3–4): 124–134. doi:10.1080/13527259808722230. ISSN 1352-7258. This page was last edited on 4 March 2019, at 00:36 (UTC).